Day 1: Travel by Jeep to Spituk and trek to Zingchen valley. Day 2: Visit Hemis National Park and climb Stok range. Day 4: Hike through the valley to reach Markha valley. Day 5: Travel along the Markha to view Kang Yatse. After lunch proceed towards the Thachungste camp. Day 6: Travel along the trail to reach the camp at Nimaling. Day 10: After breakfast cross Kongmaru La to reach Shang Gorge. After a break reach Shang Sumdo to spend the evening. Day 11: Walk to Martselan and visit the monasteries on the way to Leh. After starting early from Leh, we will avail a jeep to Spituk, where horses will be prepared to carry our gears. The trekking area will be starting from an ordinary jeep road leading to a suspended and bare area hence water and sunscreen play an important role here. 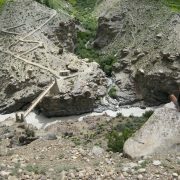 After walking through the deserted land for near about 3 hours we will reach the verdant Zingchen Valley where the beautiful Rumbak River gushes into the forceful Indus. Amidst the valley there lies our campground, in the two house settlement of Zingchen which means broad field. The rest of the day will possibly be spent in resting, or even taking a plunge in the brook. Today we will have our access to National Park of Harmis where fortune may favour us by allowing us a glance of wild life like Ladakhi Urial( a sort of goat) Red fox, Marmot, Dhole (wild dog), Mountain hare, leopard, lynx, Tibetan wolf, Blue sheep. When the entrance fee is paid we will steadily mount through a wonderful ravine that will expose the magnificent Stok Range from again and again. Before heading to Rumbak , we will takea halt at a teahouse maintained by a local rural lady. After sipping a cup of warm tea we will go on through Rumbak and cross the residence of Yurutse village, prior to reaching camp at the pedestal of Ganda La (4545 meter). From the campground we can observe a fantastic sight of Stok Kangri and the entire Stok range. 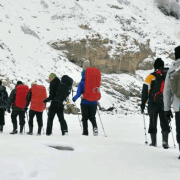 After having an agreeable breakfast, we will commence our 2-hr climbing to Ganda La; vision of the superior Zanskar and Stok Ranges will leave you out of breath. The customary chorten and prayer flags spot the pinnacle of the pass, where one may perceive blue sheep and marmots widely wandering the hills. After a petite break we will resume our hour-long plodding to Shingo and take a break for lunch. 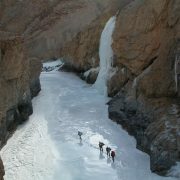 We will terminate the day by mountaineering through a stunning gorge before setting camp at Skiu (3300m). Within this tranquil community lies a time honored monastery and carcass of an old citadel (once a rest stop for the Royal family on their way to Srinagar). Pursuing the Markha River, we will trek through the attractive vale on a moderately plane pathway. The trail traverses the river at diverse points, and crosses winter settlements that enclose Lhatos (religious shrines for local deities) and Mani walls (stones inscribed with Buddhist prayers). Throughout the peak season, several tented teahouses will be welcoming the travellers, providing vigorous refreshments. After passing through the river for the final instant, we will turn up in Markha, the chief village in the vale, containing around 20 houses, a rundown monastery and a dilapidated fort. The Markha valley track prolongs past old stone-mills, a decaying bastion and the propitious Techa monastery, which is smugly perched on an immense cliff that emerges on top of Markha, it is worth stopover if we have the vigor element left anymore in us. The path crisscrosses the river numerous times before cutting through the last settlements in the dale. After departing from the rural community of Umlung, we will be offered our initial view of Kang Yatse (6400m), which will continue in vision till we traverse Kongmaru La. After we take an interval for lunch in the village of Hangkar (the last in the valley), we will push forward to the exquisite green meadow of Thachungste, where we will campsite. Today the track will be leading us to the gorgeous upland of Nimaling, where the people of the Markha Valley fetch their herds to graze throughout the summer months as it makes a beautiful pasture land. At 4700meter, Nimaling is the uppermost camp on the hike, providing us with amazing visual treat of Kang Yatse on the right, the Zangskar Range and the Markha Valley underneath. It is a balanced ascend up to the Base Camp (5200 meters). Today is decisive, so we will be spending the morning recovering from past few days’ exhaustion. 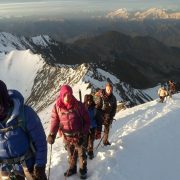 After adequate break, we will go aboard on a steep 2 hr climb to the High Camp (5500 m). Even though the expanse is quite short, the elevation makes the trek rather demanding. The concluding thrust, commencing at 2 am, will be equally bodily and psychologically taxing. 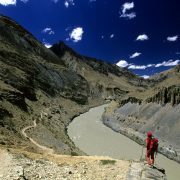 But once at the apex the pinnacle (6200meter), the overwhelming panorama of Tibet, and the Zanskar and potent Karakoram ranges will cart off our deadening pains and change them into a temperate radiance of accomplishment. After having a pleasant breakfast we will pass by Kongmaru La the mightiest pass during the hike. Here we will be witnessing a beautiful surrounding peaks and gorge and basins. The 2 h moving down is pretty sharp but the land progressively level as we move into Shang Gorge,with its outlandish and unearthly rock configuration. Added river passage block our way earlier than we turn up at the sour-spring of Chuskurmo (used in traditional medicine by the Amchi doctors). After an interval, we will cross a couple of rural community before getting Shang Sumdo, where we will spend our last nightfall jointly. With our hearts elated at a triumphant trek we will take pleasure in an aggreable 2hours walk along a jeep road towards Martselang where the jeep will be picking us up. Towards the Leh it will be likely to stop over few majestic monasteries of Ladakh like Hemis, Shey and Thikse.